Is Microsoft trying to snuff out Android with its ‘tax,’ or just milking it? Today’s cash cow is destined to become tomorrow’s cash whale. The market analysis firm Gartner recently forecast Android shipments worldwide will grow from about half a billion units last year to almost 1.5 billion units in 2017. That’s a lot of phones and tablets to turn a buck on. But who’s collecting the toll? Android has been touted as a “free and open” operating system since Google announced it back in 2007; anybody could make Android devices without paying Google a dime. 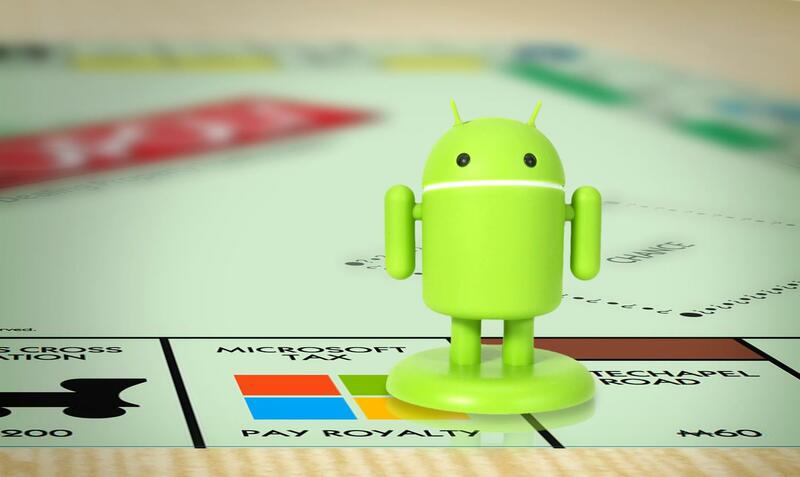 That may be true — device makers don’t have to pay Google to use Android — but the majority are paying someone else: Microsoft, which claims to hold patents over multiple technologies that are effectively baked into Android. Over the last three years Microsoft has inked licensing deals with almost two dozen Android device makers, including Samsung, HTC, LG, and Amazon. Most recently, they’ve cut deals with Hon Hai (the parent company of Foxconn) and China’s ZTE. According to Microsoft, these deals mean over 80 percent of Android devices sold in the United States and more than half of Android devices sold worldwide are covered by licensing agreements. Do these licenses amount to a “Microsoft tax” that threatens Android by raising prices and perhaps encouraging device makers to abandon Android for another operating system — say, Windows Phone? Or do the agreements (and the money they generate) perhaps give Microsoft a strong interest in seeing Android continue to succeed? Patent battles are notoriously complex, and sometimes get oversimplified – after all, last year Samsung characterized Apple’s claims of infringement as amounting to “a monopoly over rectangles with rounded corners.” Microsoft has never published a list of patents it believes Android infringes, but Microsoft representatives say many of them are related to synchronization, file storage, and security. We can make some educated guesses where the patents lie. One set are likely centered around Exchange ActiveSync, which enables users to synchronize email, calendars, contacts, and documents across desktop and mobile devices on servers running Microsoft Exchange – something most Android devices can do right out of the box. 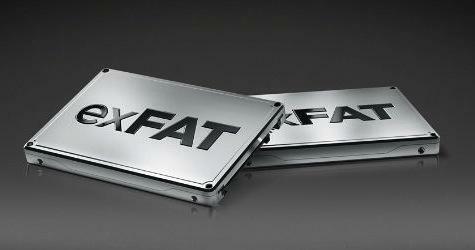 Other candidates are related to exFAT, a Microsoft file system optimized for flash-based storage. Current versions of Android use a file system from Linux, but SDXC and microSDXC memory cards use exFAT by default, so supporting SDXC media cards in Android means either getting an exFAT license or forcing users to reformat their memory cards (potentially wiping their data). This makes exFAT licenses necessary for Android device makers, along with everyone from Sharp (for televisions) and Nikon (for cameras) to automakers like BMW and Volkswagen. Court documents in cases with Barnes & Noble (now settled) and Google/Motorola reveal other tidbits, including patents related to plotting search results on a map, context-sensitive menus, and ways to keep mobile apps informed about the state of a device. Other utility patents include seemingly everyday things like loading Web pages faster without images, using selection handles in text editing, and showing window controls. Microsoft also has a patent covering using both short and long names in a file system – the same technology Microsoft cited when it went after TomTom for infringement in 2009, the company’s only Linux-related lawsuit to date. TomTom quickly settled. These technologies provide a glimpse at how Microsoft can argue its intellectual property is deep in Android, and convince device makers to make a deal rather than take their chances in court. If you use Android, have you loaded a Web page? Selected text? Synced with Exchange? Used an SDXC card? Have long and short filenames somewhere on your device? Guess what: you might be infringing on patents Microsoft claims as their own. Android still calls itself a free and open mobile platform; however Google has not been willing to indemnify Android device makers against infringement claims. In effect, Google’s message to device makers has been Android is free and open, but you’re on your own if someone sues. As a result, Microsoft has been very successful negotiating licensing deals. Microsoft representatives have consistently told me Android licensing agreements are “generally” royalty-bearing, meaning Microsoft probably receives money for each device. No one would discuss royalty amounts or ranges, noting the agreements are private in part to protect their partners’ confidential business information. How much could Android licenses be worth to Microsoft? That hasn’t stopped speculation. In 2011, Goldman Sachs calculated Microsoft would earn about $444 million in Android licensing during 2012. Last year, analysis firm Trefis estimated Microsoft pulled in over $790 million on Android royalties during one quarter of 2012 just from HTC and Samsung. If Gartner’s forecast proves accurate and Microsoft gets an average royalty of $1 per Android device, it stands to generate about $430 million in 2013. Those figures are probably conservative. If Microsoft earns an average of $8 per device, that figure jumps to $3.4 billion just for 2013 — still assuming Microsoft gets royalties on only half of Android devices sold worldwide. Microsoft already claims more, and additional licensees would make the percentage larger. By 2017, with the same assumptions, the figure could be almost $5.9 billion. 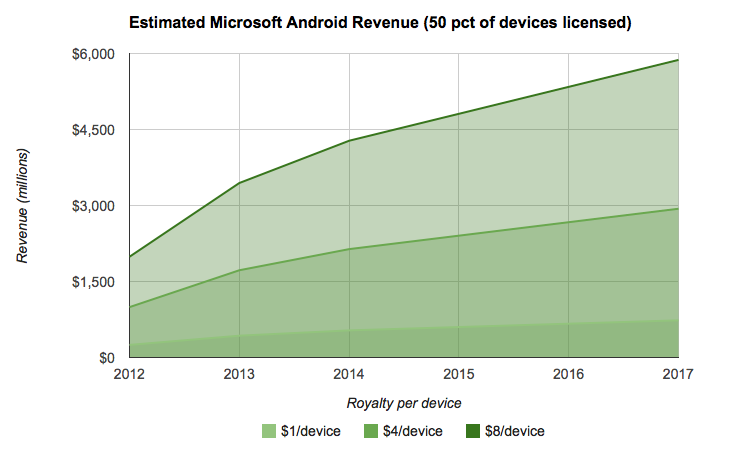 If Microsoft collected royalties on 75 percent of Android devices sold, by 2017 that could be worth over $8.8 billion. Android devices do cost more as a result: consumers might not see the difference in a $600 unsubsidized Samsung Galaxy S4, but it will be more apparent in low-cost devices where a fixed per-device royalty will account for a larger proportion of the price. Android devices will only get so cheap. 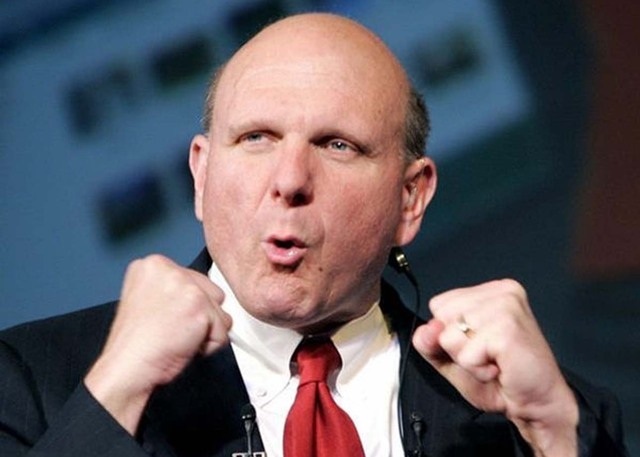 Will Microsoft use try to use its patents to try to crush Android? It seems unlikely — if Microsoft were going to deny licenses to major Android players, it would have done so by now. On the contrary: Android seems to be offering hundreds of millions — maybe billions — of reasons Microsoft would want Android to succeed.